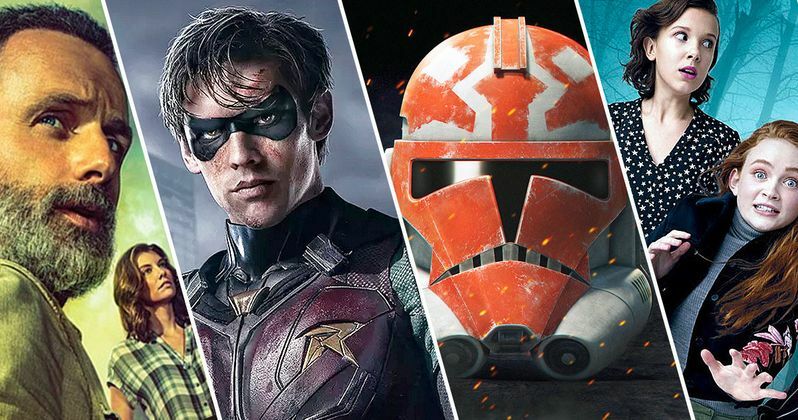 San Diego Comic-Con 2018 was the year of TV trailers. It's amazing to see how big the world of television has become over the last handful of years with Netflix, HBO, Showtime, and the usual networks adding brand-new content. There were some shows that were expected and then some brand-new surprises that nobody saw coming. With that being said, we have compiled every single one of the must-see TV trailers from Comic-Con below, so you don't have to go searching for them. Things kicked off early when Netflix, who skipped out on all the Hall H madness, dropped a teaser for Stranger Things Season 3 that goes inside Hawkins' new shopping mall. It certainly caught everyone's attention, especially when the end of the video teased a summer 2019 release date for the show's return. The heat really got turned up though when the first trailer of the Con officially dropped. And it's possibly the best sneak peek released over the past four days. A kickass Robin showed up in the hyper-violent first trailer for DC's Titans, and he literally says, 'F*** Batman!' It was a shocker that got things off to a grand start in San Diego. The Titans trailer was followed by the first full-length look at FX's Sons of Anarchy spinoff Mayans MC, which looks like it has the potential to be another huge hit for Kurt Sutter. AMC released a new look at Jimmy's descent into becoming Saul Goodman in the Better Call Saul Season 4 trailer. And perhaps the biggest TV news came when Disney and Lucasfilm announced Star Wars: The Clone Wars was returning with an extended trailer that revealed the big news. The extended Nightflyers trailer showed off a better look at George R.R. Martin's sci-fi horror series. And Doctor Who Season 11 let Jodie Whitaker show her stuff as the new Time Lord while introducing her best friend. AMC owned Thursday morning when it released back-to-back trailers for Fear the Walking Dead and The Walking Dead. And Marvel fans were quite happy with the Iron Fist Season 2 teaser, with some calling the 90 seconds of footage better than the whole first season. Star Trek: Discovery got a new trailer that teased the emergence of Young Spock, and gave us a big wet alien sneeze. On the horror side of things, we hot a new look ay Lore Season 2, Preacher dropped an insane Season 3 trailer, and we got our first look at Paul W.S. Anderson's Origin trailer. Stan Against Evil came through with a kickass trailer for Season 3. Vikings Season 5 midseason premiere trailer brought plenty of thrills. And The Purge TV show also got a new trailer that was just down right scary. On the comedy side of the Con, we got a first look at new Family Guy episodes and the next Simpsons Treehouse of Terror. Speaking of the Simpsons, Netflix released a new trailer for Matt Groening's medieval animated comedy Disenchanted that seemed to go over really well. Saturday belonged to The CW. They came packing fresh trailers for Supergirl, Arrow, The Flash and Legends of Tomorrow, offering looks at new villains, fresh faces and incoming storylines. The CW also dropped an awesome retrospective trailer for Supernatural, leading into Season 14, and fans got a look at what's in store for Riverdale in Season 3. The CW also gave fans a look at Legacies, which continues the saga started in The Vampire Diaries and continued in The Originals. Kids definitely weren't left out of the equation. An action-packed sneak peek at Rise of the Teenage Mutant Ninja Turtles packed quite a wallop. DC fans got their first look at Young Justice: Outsiders, which has been revived for DC's new streaming service launching later this year. The Voltron Legendary Defender Season 7 trailer decimated fans with its hard-hitting animated violence. Nickelodeon gave everyone a first look at their animated TV movie Invader Zim, which brings the annoying alien back to the small screen. Perhaps the biggest news was when Cartoon Network dropped the trailer for Steven Universe: The Movie, announcing it for the first time. The trailer for Titans was also one of the most anticipated trailers of this year's San Diego Comic-Con and fans are still talking about it. The show is a gritty take on the Teen Titans and it proves itself right off the bat. Robin can be seen in the trailer saying, "F*ck Batman," which should tell you where this one is going. The Titans trailer may not be safe for the family to watch. Stranger Things and Netflix didn't really have a presence at Comic-Con, aside from turning a wayward bus stop into the Upside Down. But right before the big event kicked off, Netflix launched a new teaser that goes inside Hawkins' new mall, and shows Steve working at the ice cream shop. It's a fun little teaser video that will make any 80s kid nostalgic for the mall. But then we get to the end of this sneak peek, and it's hinted at that Season 3 may not premiere until Summer 2019. Which certainly bombed out a lot of fans. The return of Star Wars: The Clone Wars was a complete surprise. Nobody saw this coming and Star Wars fans are over the moon that they will finally get some closure on the series, which was unceremoniously canceled back in 2014. Dave Filoni announced that the show will be returning in 2019 for Season 7 with 12 brand-new episodes. AMC's The Walking Dead panel revealed that Season 9 will be the last season for main character Rick Grimes. Actor Andrew Lincoln confirmed the news, but says that the upcoming season is going to be one of the best yet and that it's going to have some pretty big surprises. Norman Reedus' Daryl Dixon is expected to take over as the leader. Plus, Jon Bernthal is back as Shane Walsh for an episode. Fear the Walking Dead's second half of Season 4 has brought together some unlikely alliances. The first half of the season saw the devastating loss of one of the major characters from the prequel series. The second half of the season is looking to be an action packed storyline that will see the characters come across some new enemies. The Doctor Who Season 11 trailer premiered at Comic-Con and featured Jodie Whittaker officially taking over as the doctor. The long-running BBC series is always a highlight of San Diego Comic-Con and this year was no different. Season 11 has already had some major behind-the-scenes changes, so it will be very interesting to see how the first female doctor does when the show premieres in September. The Star Trek Discovery Season 2 trailer wasn't really one of the most anticipated of the Comic-Con weekend, but there's been a lot of talk about it since it premiered. Season 1 ended with a pretty big tease that the young version of Spock was going to appear and the new Season 2 trailer confirms it. While there's no sign of the Star Trek legend in the trailer, his uniform is shown and the search for Spock will begin in January of 2019. The Season 3 trailer for Riverdale premiered at Comic-Con and it looks like Archie had a pretty rough summer. The CW series will take place after a time jump that shows Archie out of jail for a crime he did not commit. At the end of Season 2, Archie was accused of killing Cassidy Bullock and the upcoming season will show his trial, but it will also feature him with his pals. Marvel's Iron Fist was definitely one of the more hyped of the television trailers. While the trailer was rather brief, it featured some pretty intense footage of Danny Rand taking on some bad guys. There have been some major hints that Steel Serpent will be the antagonist this time around after getting teased in Season 1, which has Marvel fans really excited. Supernatural is always one of the most anticipated panels at San Diego Comic-Con, and this year was no different. It has been confirmed that Dean will return in Season 14 after a questionable season finale, but that's all that we know at this time. Additionally, Season 14 will see the premiere of the 300th episode of the hit series, which will contain many surprises. The CW's Arrow Season 7 trailer finds Oliver Queen in prison facing off with some of the very criminals he put in there. The show returns in October, and it will see a new group of villains on the hunt for Queen. Star Stephen Amell hopes that the first episode of the new season really "pisses" fans off, which should give one a good indication of what's coming up. Arrow returns in October.